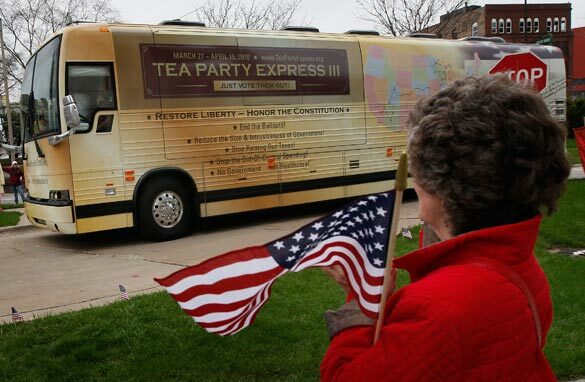 "The Tea Party Express with over 400,000 members is by far larger than the Tea Party Federation’s entire membership. Most rank-and-file tea party activists think we’re talking about Star Trek when we try to explain who the “Federation” is. Given the absurdity of the actions by the "Federation," this is quite fitting, since their conduct is alien to our membership. "Groups trying to say who can or can't be 'expelled' from the tea party movement is arrogant and preposterous. Perhaps this explains why so many tea party groups have left the "Federation" during the past few months. Whatever the reason, most tea party activists are focused on taking back their country and the upcoming 2010 elections and not silly power games being played by individuals such as those in the "Federation." "To add to the absurdity of the "Federation" they have also informed us that our members can't participate in something called their "basecamp" communication network, which makes us think that the individuals involved in the "Federation" spend a bit too much time watching science fiction movies and cartoons. We here at the Tea Party Express prefer a focus that is more grounded in the Constitution and electing tea party conservatives to offices of import in these 2010 elections. The "Federation" has enabled and empowered the NAACP's racist attacks on the tea party movement, and they should be ashamed of themselves. "Circular firing squads of groups within the tea party movement attacking one another accomplish nothing, and on this issue the Tea Party Federation is wrong, and has both enabled and empowered the NAACP’s racist attacks on the tea party movement. Which is something they'll realize when they beam themselves back from basecamp." Where'd the 400,000 membership come from? I think that is another Tea Klux Klan party lie. The Tea Kluxers are financed by right-wing corporate fronts like "Freedom Works", there is no 'grass-roots' to this organization, only green-colored plastic. Again, where were these tea party people when Bush and Cheney were ruining this country with record setting budget deficits and tranmpling the constitution, starting an unnecessary war in Iraq and killing our young America lives, ramming through an unfunded drug prescription bill benefitting the drug and insurance industries, and, lastly, giving us the worst financial meltdown in America history since the Great Depression? LET ME REPEAT, WHERE WERE THE TEA PARTIERS THEN? I STRONGLY BELIEVE THAT THEY PROMPTLY SURFACED AND PROMPTLY CAME OUT OF THE CLOSET UPON THE ELECTION OF PRESIDENT BARACK OBAMA WHO IS HALF WHITE AND HALF BLACK. THEY JUST REFUSE TO SEE AND REFUSE TO ACCEPT THE WHITE PART IN HIM. Maybe the Tea Baggers would have more credibility if they were ever seen surrounding those dang racist infiltrators and shooing them away like a fly at a picnic. Funny how they never do that though, isn't it? How about some crumpets to go with your tea as you eat your own, you friggin' morons???!!!!! No plans – just chant slogans – no real idea of how to implement smaller government (still small enough to decide about abortion & gay marriage?) – small enough not to clean up oil spills? Cut spending? Clear ideology there!! No extension of unemployment benefits ( or ideas on real job creationg) but plenty for more tax cuts for the well-to-do ... and it does not "trickle down!" It's really quite sad. The tea party movement started out as something that was definitely good and worthy of support, as a protest against the obscenity that was the government bailout of the financial sector, the ridiculous concept of "too big to fail", the mountain of regulations that played a large part in creating the crisis in the first place (at the time of the crisis, the financial sector was regulated by no fewer than 121 different government agencies, each with volumes of fine print regulations... don't talk to me about "deregulation"...), and a general protest arising from the ever increasing pervasiveness and scope of government interference in American's every day lives. It was about returning to the principles of individual rights that America was founded on, and refuting the collectivism, statism, and yes, even racism, that is infesting the nation more with every passing day. Then the "state's rights" libertarians got involved, and that was a step backwards. Then the theo-fascist ultra conservative wing of the GOP, the Rushes, the Becks, the Palins showed up, and that was a HUGE step backwards (personally for me, Palin was the watershed moment... as soon as the movement embraced her, it was dead.) And now, unsurprisingly, the neo-Nazis are showing up. Hell, there are neo-Nazi's patrolling the borders in AZ in the name of keeping out "illegals", and people are just fine with that. "At least somebody is doing it... so what if they're neo-Nazis?" How sad. Then, as a final straw, the extreme left appropriated a crude sophomoric sexual slur, "teabagger", and the movement was not only too stupid to figure out what was being said about them, when people pointed it out, they did nothing about it. It stuck, and now simply uttering the word teabagger is enough to instantly end any form of intelligent debate on any subject. It's like calling someone a racist, only more so. No proof of anything is required. Just the accusation is sufficient to dismiss anything the person has to say, and make the person saying it untouchable. Again, how sad. The country is diseased, and the tea party movement, unsurprisingly, is starting to reflect the decrepit state of the nation. Intelligent conversation is no longer possible. We are reduced to the crudest forms of collectivism... racism, slurs, and name calling. It is no longer possible for anyone of good conscience to associate themselves with anything to do with the tea party movement, regardless or what name they use or what "faction" they are. I have nothing useful or constructive to say... kind of like the Tea Party Express manifesto I just read. Yah Express and Federation go onand duke it out. See ya next election in 2014. 400k members, that's it!!! Come on, givbe me a break, why are we even listening to these ignorants. Over 100 million people voted two years ago. These are just a bunch of old, retired, racist folks. Stop giving them so much attention. Hey Tea Party sippers, what do you mean "take our country back?" You mean back to Bush days? No.....in 2008, 'we the people' took our country back and we put the one man in office we felt we could trust as he heard us and he understood us, "we the people". Believe me Tea Party sippers, your mere 400,000 is a pittance compared to us millions who believe in fair and truthful government. We may not be in great shape, but we are in better shape today than at any time in the past decade. Wake up. We are not giving our country to a bunch of racist angry people who eschews reason as if it were rat poison. Nor, are you taking anything from "we the people". I just read Joe Wierzbicki's statement. What utter nonsense from this member of "The White Annoying Teabagger" party. He obviously has the IQ of an ameba. But I must give him some credit as it must of been verry difficult for him not to use the N word. Doesn't matter,you dem are retarted. The bigger picture is this bush bashers. We support small gov't, lower taxes,and to keep are freedoms. Not BMI results for our kids,not running across the border, not obama care,not avoiding the gulf of mexico to play golf 13 times a month,not a global economy,not socialism,not social justice. I'm not your f-ing personal credit union. Bush signed into law an act that took away some civil liberties the Constitution specifically protects. If the Tea Party wants even the slightest bit of respect from me, cop to the fact that the formerly Republican administration did exactly what the Tea Party supposedly opposes, but that the GOP is now willing to work with the Democratic administration to restore those civil liberties. Until you stop blaming the current administration for something the former one screwed up, you're just a bunch of flies buzzing in my ear. but he and Failin Sarah Palin made a lot of money from these sheep who watch Fox to get their cues and talkin points. Their real beatdown comes in November with Rand Paul and Sharon Angle. Good riddance. Yeah! Yeah! you express it brother...those kumbaya loving Federalist have no idea just how much hate needs to be expressed..no one is going to tell us not to be racist! NO ONE!! You should launch another one of those awesome tours..but this time we can focus on burning crosses along the Rio Grande!! YOu see we can kill two birds with one stone...our freedom of expression and socking it to the illegals! Brilliant...Mr. Express, you are a racist in denial. See how easy it is to get the Left Wing Libbers or New Age Progressives all roused up.. it's totally FUN! Now that is what I call "Cattle Call"! !